2. How I'd Luv To Touch It! Ron Soltis: Keyboards tracks 1, 3-7, 11. The Duplex, Hot Sound, NYC & Tube Bar Studio, Brooklyn, NY. Engineered, mixed and mastered by Rich Gaglia. Assistant engineers: Tony Ungaro, Steve LaCerra, Jon Price. Mixing Conultants: Tony Ungaro, Suz Dyer. Photography & Digital Imaging: Austin Trevett. All Songs written by Chris Giunta except Track #9 written by Giunta/Allen. 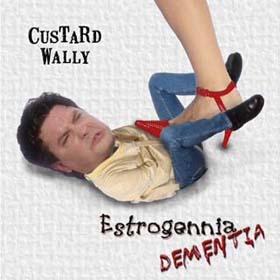 Custard Wally thanks and sez hullo to: G-Rod & Deb, Rob & Hae-Jin, Jeff Kelly, Joe "PH" Gurzynski, John Thomas and Opel Doris Hell, Henree Alyse, Eddy Pecker, Bob P. & Mike, Mr. Marc, CG Realty, Kari Zalesak, Steve LaCerra, Bernadette McCallion, Jeannie Fry, Ron Soltis & family, R.A. Norwood & family, Pat Duncan & Jen Klein at WFMU. Gino, Ludy & Uge. Rich Gaglia at Rich Sound. Bob, Mary & Rachael at Digital Domain. Trigger, Walt Stack, Noel & Zack at The Continental. Everyone at Roxy & AM Studios. Gina Sabio, Cooper, Mortimer Snerd, Hannah Banana, Sylvia, Angel, Sydney Dane and Chase Face, Courtney, Shawn Ono Leger, Shawn Doll-e-lama, Jill T11 Parker. ES would like to give special thanks to Little Billy Bloom for his years of abusive derision. Debbie Pignetti for all of her efforts at our gigs, and everyone who came to the 2005 shows.